I have a feeling you could spend all day, every day for a long time in Tokyo harvesting signs like these for the consideration and amusement of native English speakers. And when you were done with Tokyo, you’d have the rest of Japan to cover. We talked a little bit today about English language words and names terms and why they’re popular here. In a lot of cases, it seems they’re employed merely as decoration–no one reads them for a literal meaning; their presence alone lends some sort of smart, cool quality. 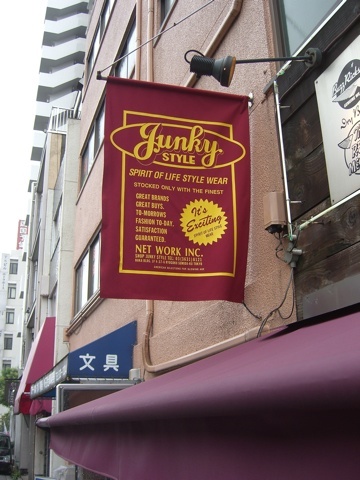 And somehow that leads to “Junky Style,” “Nudy Boy,” and all the rest. Clicked in for some Cub/WhiteSox RE-act. But as long you’re ober by dere, a recent visitor happy footed up Mount Fuji to help fill the memory bank. Sounded like something you’d enjoy if you haven’t already. Also, a belated nod to Johnnie Gotham. First pitch at Wrigley in 5 hours. William S. Burroughs might go for that first one. Billy B. enjoys the baseball? Holy COW!!! Lydell…I see what you mean.